World Book Day is celebrated today, but just what is being commemorated? 23 April was chosen as “World Book Day” because it supposedly coincides with the death of Miguel de Cervantes, William Shakespeare and Inca Garcilaso de la Vega on the same date in 1616. 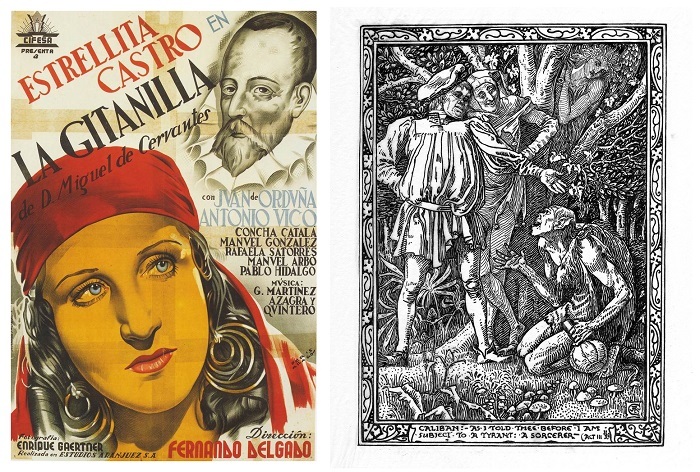 Everyone (through World Book Day celebrations, and in schools and on television news) commemorates Cervantes and Shakespeare, but not Inca Garcilaso. The fact that nobody remembers him has to do, in my opinion, with both the fact that he was mestizo (the son of a Spanish captain and an Incan princess, he was born in Peru) and with the Eurocentrism that promotes the social belief that everything that is important comes from Europe. 1) Shakespeare spoke of Romani women (your mum, my mum, your agüelica [grandmother] and mine, your sisters and mine, our wives and perhaps you) as “lustful”. In fact, he characterised Cleopatra (Antony and Cleopatra, 1607) as being in possession of a “gypsy lust”. Furthermore, Caliban (a character from The Tempest, 1611) embodies all the typical anti-Roma clichés such as bearing responsibility for spreading plague and engaging in savagery, having sloppy habits, etc. If you were not already aware, “Caliban” derives from the Romani expression kalipen/kaliben, denoting darkness. Shakespeare probably knew Romani people (he worked in the theatre, and Roma always had a presence in that world of the spectacle) and thus would have been able to create such a character with that name. 2) We already know Cervantes’ famous passage at the start of La Gitanilla (1613) [it seems that Roma were only born to be thieves: they are born to parents who are thieves, grow up with thieves, study to be thieves and, finally, end up being common, run-of-the mill, out-and-out thieves; and their thirst for stealing and the act of stealing are inseparable accidents within them that are only extinguished by death]. It is not the only passage in which he speaks (badly) of us. What not so well known is why the payo Miguel de Cervantes hated Roma: an aunt of his cohabited with the Archdeacon of Talavera, Martín de Mendoza, nicknamed the “el gitano” because he was the son of a Romani rider named María Cabrera, and fruit of that cohabitation was Martina who denied him lovers [read the whole story here]. As you can see, the payo Miguel also knew Romani people. I wanted to emphasise the fact that both the payo Miguel and the jambo William knew Roma because sometimes we ourselves believe the old cliché which says that anti-Roma sentiment is the result of ignorance. No, my beloved friends, anti-Roma sentiment is the result of ill-feelings, hijaputez, with that dark look that our uncle José Heredia would speak of. So, I do not now celebrate anything although books are the sustenance of my intellectual being.